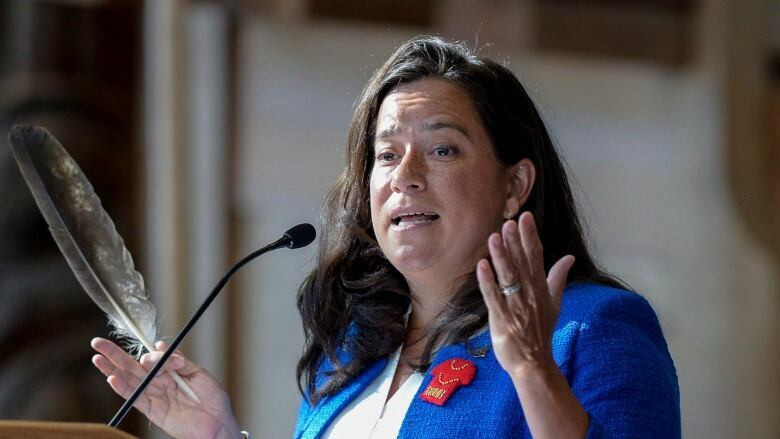 The overrepresentation of Indigenous people in Canada's justice system is a "sad reality," says Justice Minister Jody Wilson-Raybould, who spoke in favour of taking a restorative approach to justice during a speech at a Canadian Bar Association conference in Ottawa on Friday. The overrepresentation of Indigenous people in Canada's justice system, both as offenders and victims, is a "sad reality," Attorney General and Justice Minister Wilson-Raybould said in a speech at a Canadian Bar Association conference in Ottawa on Friday. While Indigenous people in Canada make-up 4.3 per cent of the population, they represent more than 25 per cent of inmates, Wilson-Raybould said of the most recent findings by Canada's prison watchdog. Between 2005 and 2015, the Indigenous inmate population grew by 50 per cent compared to the overall growth rate of 10 per cent. Indigenous women comprise 37 per cent of all women serving a sentence of more than two years. Incarceration rates for Indigenous people in some parts of Canada are up to 33 times higher than for non-Indigenous peoples. She called the statistics "shocking." Wilson-Raybould has been tasked by Prime Minister Justin Trudeau with reviewing the criminal justice system, including sentencing changes brought in by the previous Conservative government. As a former Crown prosecutor, Wilson-Raybould said she was able to see first-hand the inequities facing Canada's Indigenous people. "I often saw young Indigenous men in the courtroom who were charged with non-violent property crimes. Far too often these men got caught in a vicious cycle within the system that led them to spending more time behind bars than in their communities." In her speech to a room full of lawyers, the justice minister spoke in favour of taking a restorative approach to justice. "Along with studying how the system affects the most marginalized segments of our population, the review will also look at the important role discretion plays in the criminal justice system. Measures such as restorative justice in sentencing circles, where appropriate, could provide off-ramps to the justice system and possibly lead to lower incarceration rates for non-violent offences. "I am committed to being a champion of such measures," Wilson-Raybould said. The justice minister said that having a national inquiry to get to the "root causes" of the disproportionate rates of violence that Indigenous women and girls face in this country will also help with her review of the criminal justice system. On Thursday, Wilson-Raybould appeared before the Commons justice committee where she defended the Liberal government's new process for appointing Supreme Court judges. Her remarks came hours after Canada's Chief Justice Beverley McLachlin called for a meeting with federal justice officials to solve the "perpetual crisis" with the current selection process for hiring judges.